In recent years a certain amount of suspicion has attended the stories of those repressed Victorian gentlemen who became friends with, and told stories to, young children. J.M. Barrie’s potential over-attachment to the young boys of a widow sits right next to the century-old delight of his “Peter Pan.” And then there is the mystery of Charles Dodgson, aka Lewis Carroll, and the three days excised from his diaries. During those days something changed in his relationship with the three girls of the Liddell family, especially the middle daughter, Alice. Before, the two had been fast friends, forming the foundation for “Alice’s Adventures Underground” or “Alice in Wonderland”. Afterward, the friendship vanished, and association with the Liddells all but vanished. Speculation about those three days has been pondered ever since. 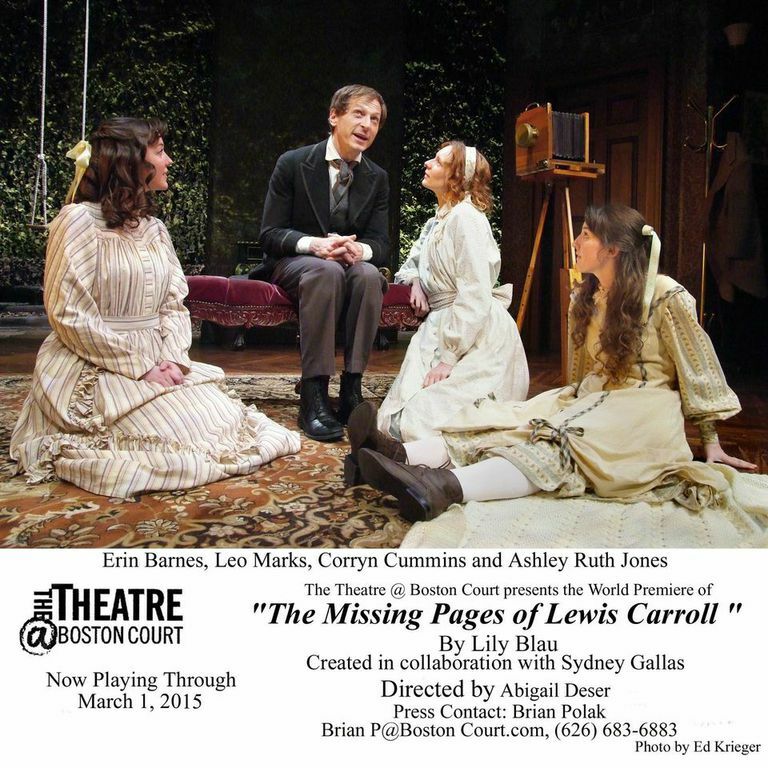 Which leads to Lily Blau’s “The Missing Pages of Lewis Carroll,” developed in collaboration with Sydney Gallas at The Theatre at Boston Court, in Pasadena. Now receiving its world premiere, the play examines the larger storyline behind Dodgson’s connection to the Liddells, at least as it might have been. In the process it covers Dodson’s professional relationship with their father, to the brilliance of Dodgson’s mathematical mind as a lecturer at Christ Church College in Oxford, to his passions for photography and nonsensical writing, for which he is best remembered. Also on hand are his foibles – his stammer, which made him socially awkward with adults, and his enforced repression as an ordained deacon, which may have contributed to concerns about his fascination with the family of pre-pubescent girls. The play leaves the relationship as somewhat of an open question, allowing for Dodgson’s fantasies, yet leaving the audience to decide whether or not he recollects his time with the Liddells as it actually happened. Leo Marks appears the essence of vulnerability as Dodgson, from his speech troubles to his jittery sense of excitement. Jeff Marlow becomes his alter ego as the White Rabbit, pushing him to remember that time yet always with an edge: did he or did he not live out his fantasies as time passed. Corryn Cummins creates the rebellious, somewhat rough-and-tumble Alice whose unique curiosity fueled Dodgson/Carroll’s storytelling, all the while managing to capture the trusting innocence of a protected child. Erin Barnes gives her older sister Ina the edge of logic and practicality Alice lacks, while Ashley Ruth Jones gives the younger, sicklier Edith an impatience and even occasional detachment as her illness progresses. All three girls, though young in the storyline are played by adults, which works in part because the entire tale is in Dodgson’s mind – age is relatively less important than image – and partly because it removes any extra disquiet from the underlying implications of the plot. Erica Hanrahan-Ball gives real spine to the protective and disapproving Mrs. Liddell, while Time Winters makes her husband a man of balanced forces and kindly tone. Indeed, it is perhaps Winters and Hanrahan-Ball and their read on their characters, which frame the questions posed by the White Rabbit and the storyline itself. Director Abigail Deser, who has worked with the playwright for several years to hone and polish this piece, creates a state of underlying tension amid an atmosphere radiant of the time and place the story occupies. Stephen Gifford creates a fascinatingly modular set, opening up or closing off Dodgson’s world with the flick of a piece of panel or the slide of a drape. Likewise, Jaymi Lee Smith’s lighting takes one from literal to fantastic in subtle ways. Costumer Garry Lennon gets a lot of it right, though someone needs to do some serious doctoring to Dodgson’s tie. Nonetheless, the careful crafting of this piece is obvious everywhere, and the playwright’s fascinating juxtaposition of the internal fantasies of a man whose social life was thwarted in numerous ways and the overt world in which he walked day by day keeps one interested from start to finish. 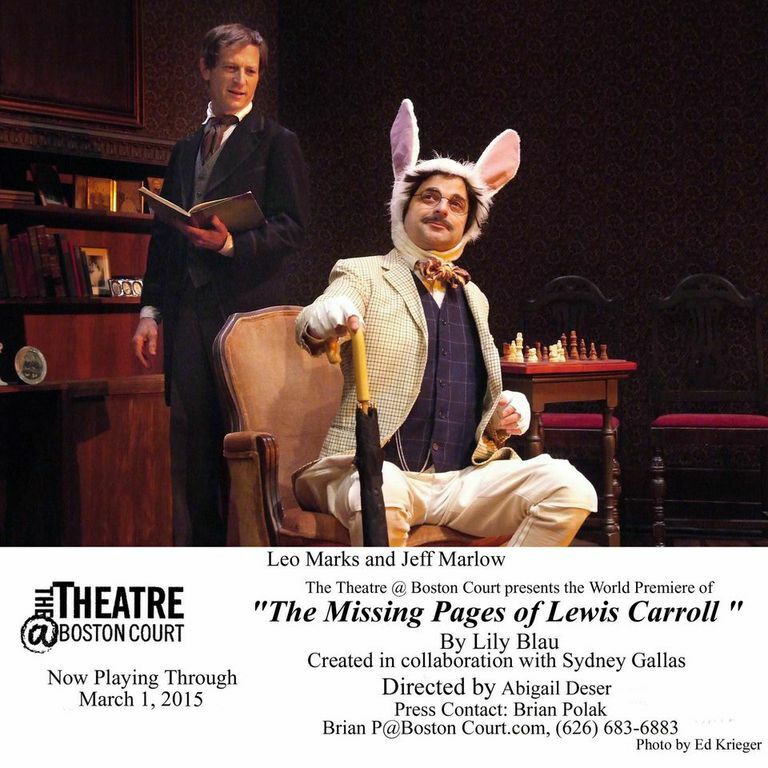 “The Missing Pages of Lewis Carroll” is performed without an intermission, and one can see why as the tensions and angst grows slowly over the course of the piece. In the end, one is left to answer one’s own questions. Nobody knows what really happened in that three day gap, and this script allows one to be more or less generous to Dodgson and to Carroll, depending on how one reads the performances and the performers. It makes for an interesting evening, and significant discussion post-performance. But then, most of what the Boston Court does is worthy of discussion, though since this play has more its feet on the ground than some, this conversation may be a bit more about the real. Check with the theater, as the Boston Court is known for after-play discussions of historical and literary aspects of the time period and the play, and several are offered this time.